I’m a creature of habit. When it comes to cooking dinner, it’s either chicken fajitas or eggs and TJ’s pumpkin waffles (#breakfast4dinner4life). It’s not that I’m not an adventurous eater (bring on the tendon soup and octopus carpaccio), it’s just that cooking old standbys is quick, simple, and satisfying. The same can be said for my recent wardrobe purchases, 90% of which have been gray or black. For better or worse, this tendency toward the familiar has trickled into my sewing life. In keeping with my goal of sewing one item of clothing for another person each month, I bought Thread Theory’s Strathcona pattern to sew a shirt for Marc. 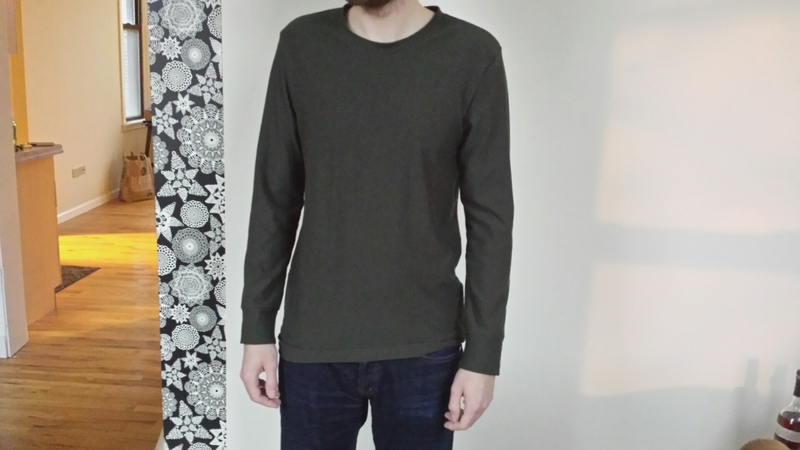 In early November, I finally got around to buying the fabric: a french terry from Girl Charlee that’s a soft, stretchy cotton-modal-lycra blend in a deep forest green. 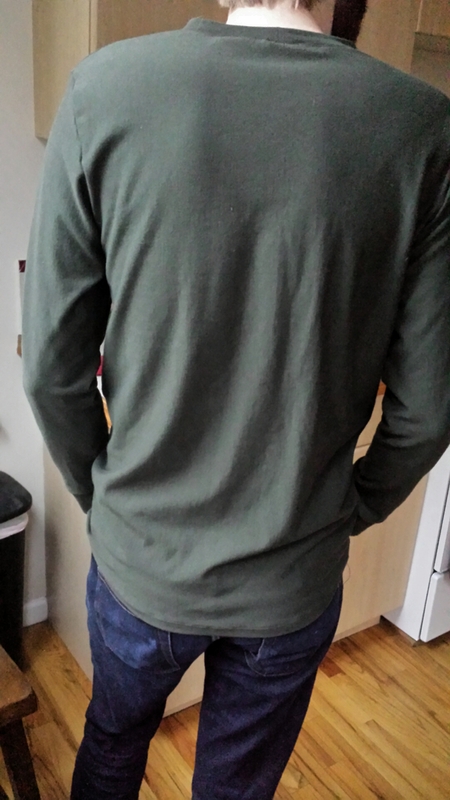 I’d just finished cutting out the fabric to make the long-sleeve T-shirt variation when I spotted it: a long-sleeve crewneck thermal from the Gap in nearly an identical shade of forest green, taunting me from its spot in Marc’s clean clothes hamper. At that point, I thought about making the short-sleeve variation instead, but then I remembered I’d bought Marc a short-sleeve American Apparel tee last year in, you guessed it, a nice shade of dark olive. We’re defenseless against the power of the solid neutrals! 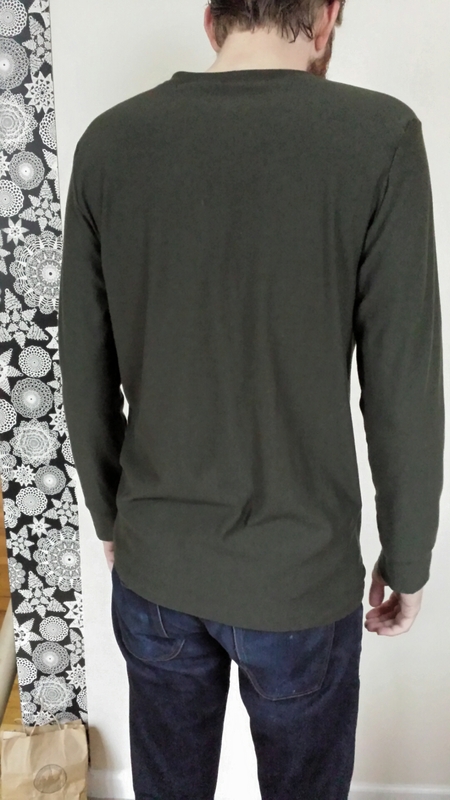 So, a long-sleeve forest green Strathcona it would be. Marc is 6’2″ and generally wears a slim-fit medium in shirts, so I cut a medium. 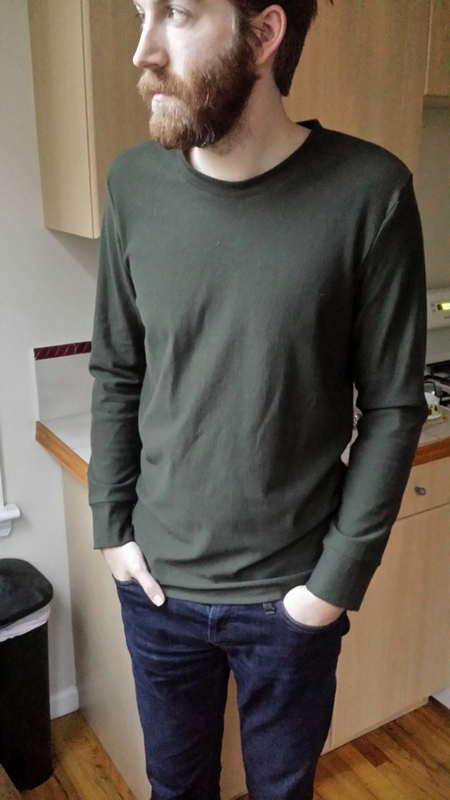 The general consensus for this pattern is that it runs a bit long in the body and very long in the sleeves, so I kept the body as is and took a bit of length off the sleeves. As far as construction goes, the shirt came together pretty easily, although next time I’ll use my walking foot to keep things smoother. I think the walking foot would have been especially helpful when attaching the sleeves, since I ended up with some weird pockets on the shoulder seam and had to do somewhat of a hack job to get them to lie flatter. I could definitely use a bit more practice setting sleeves with a knit fabric. (Actually just setting sleeves in general!) Anyone have tips for that? The pattern calls for the sleeves and bottom hem to be finished with self-fabric bands or a twin-needle hem, so I went with one of each: banded cuffs and a twin-needle bottom hem. This was my first experience with a twin needle, and I’m smitten! 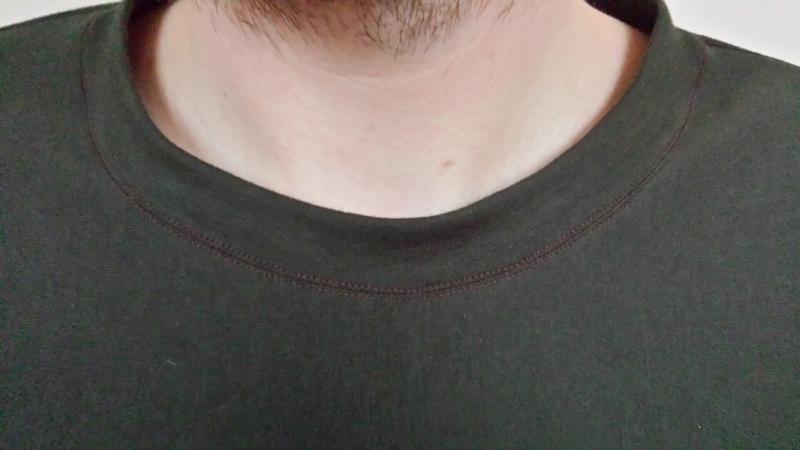 I also used it to topstitch the neckband. It so easily adds a more professional finish with barely any extra effort. And that’s about it, folks! The important thing is that Marc thinks it’s comfy and likes the color (duh). Have you sewn any garments for the dudes in your life? I’m not very familiar with menswear patterns, so any suggestions are welcome! Next up on my docket is the Linden Sweatshirt from Grainline Studio. Stay tuned for that, or a possible pre-Christmas sewing meltdown. Only time will tell.